Thermaltake combines the patented gorgeous LED light with cutting-edge technology to deliver a brand new experience of using PC cooling, Thermaltake Riing Plus 12 LED RGB Radiator Fan TT Premium Edition. A 120mm high-static pressure fan with a patented 16.8 million colors LED ring and 12 controllable single LEDs, the Riing Plus 12 RGB features compression blades, hydraulic bearing and a digital fan controller, and can be controlled by the patented Riing Plus RGB Software. Cool your system with high performance Thermaltake Riing Plus 12 RGB! Patented LED Design: Featuring 12 controllable single LEDs, the built-in LED ring can paint your build with 16.8 million colors. 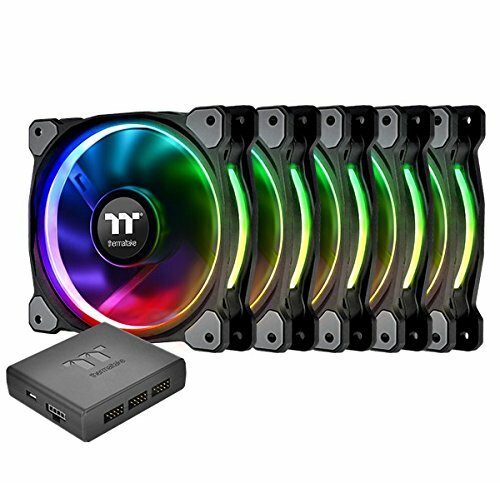 Patented Riing Plus RGB Software & App: Monitor the fan performance, adjust the fan speeds, and customize the lighting effects for up to 80 fans with Thermaltake’s patented Riing Plus RGB Software and an exclusively designed mobile app. 9 Fan Blade Design: Generate higher airflow without compromising on ultra-silent operation. Hydraulic Bearing with Low-Noise Design: The hydraulic bearing self-lubricate feature lowers operation noise while improving thermal efficiency. The seal cap prevents lubricant leakage and extends the lifespan of the unit. Anti-Vibration Mounting System: In-mold injection anti-vibration rubber pads provide a hassle-free usage with 80% protection coverage for all corners.